DID THE CONSUMER EVER RECOVER FROM THE NASDAQ BUST? Then the Nasdaq bubble burst and the paper wealth went up in flames. Alan Greenspan’s approach was simple. If we could simply reflate the consumer balance sheet through asset reflation everything would be resolved. So, the consumer was encouraged to continue taking on excess debt without the underlying income to sustain this debt. In essence, Americans were trying to sustain the lifestyle that they had become accustomed to in the 90′s and the Federal Reserve and Treasury did everything in their power to maintain that lifestyle. The surge in household wealth due to the double bubbles proved to be nothing more than paper gains that were not supported by the underlying fundamentals. Assets were higher than they otherwise should have been. It’s clear, in retrospect, that Americans never really recovered from the excesses of the 90′s. The government’s response to this bubble era has done little to help create the foundation for a sustained recovery. 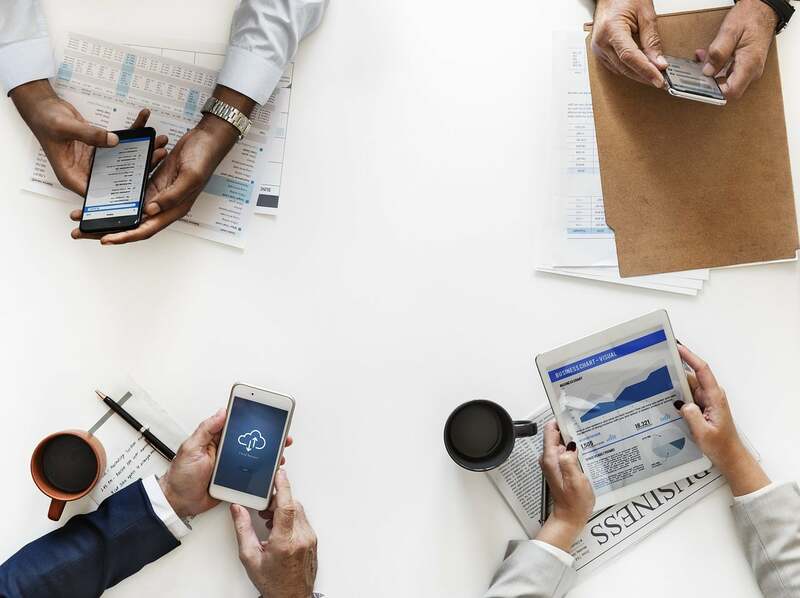 BOSTON — You may have heard recently that U.S. companies have emerged from the financial crisis in robust health, that they’ve paid down their debts, rebuilt their balance sheets and are sitting on growing piles of cash they are ready to invest in the economy. It all sounds wonderful for investors and the U.S. economy. There’s just one problem: It’s a crock. See the blue section? Yep. $10.9 trillion, to be precise. To be fair, it is down some from the peak, which was $11.16 trillion in Q4/2008. But the recent low, that is $10.9 trillion recorded in Q4/2009, is now up by close to $300 billion. So when you hear "record cash", you have to subtract back out the liabilities. At least you do if you’re being honest, which none of the mainstream media clowns are. There’s your "growth" in non-financial business credit. Now let’s compare against stock prices to see whether leverage is "reasonably reflected" in them…. Uhhhhh… that’s not so good….. Specifically, notice that during the "climb out" from the 2002 dump leverage continually increased. That is, while prices roughly doubled so did total outstanding business credit. The problem with this progression is that you only get benefit from that if you can profitably employ the credit you have out. When equities dove then and only then did businesses cut back – and not much! And now, with the nice little rampjob from the lows, businesses have stopped de-leveraging. Into excess capacity this is suicidal and is one of the (many) reasons that I say that equity valuations are dramatically unattractive at the present time. De-leveraging grossly compresses multiples, which serves to amplify the damage that comes from debt service that is required on non-productive borrowed funds. 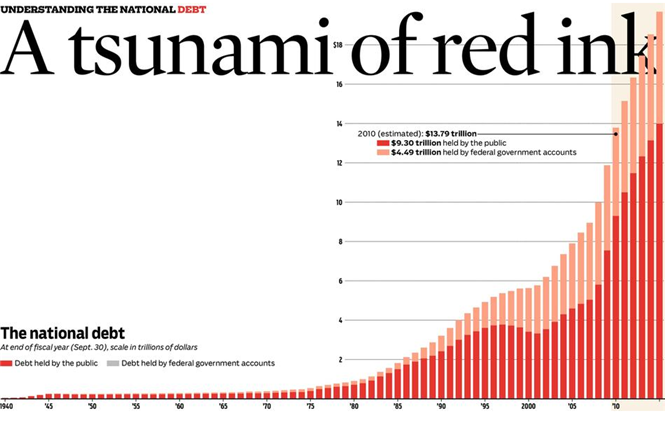 The Chicago Tribune had an excellent set of charts this weekend in A Tsunami of Red Ink regarding US government debt and who owns it, and also a comparison of US debt to the national debt of other countries. Click on the link at the top to see foreign holders of US debt country by country. The top three US debt holders are China, Japan, and Canada. Some will not believe those figures on debt to GDP comparisons. I don’t either. For starters the numbers are from 2009. The footnote also says, if intragovernmental debt is included the figure is 83%. That number is approximately correct in my opinion (as of 2009). Some will want to count unfunded Social Security and Medicare liabilities out to 2050 or whatever. This is simply wrong. That would be like counting a car you intend to buy 3 years from now as part of your debt now. Many things can happen between now and then. You may buy a smaller car. 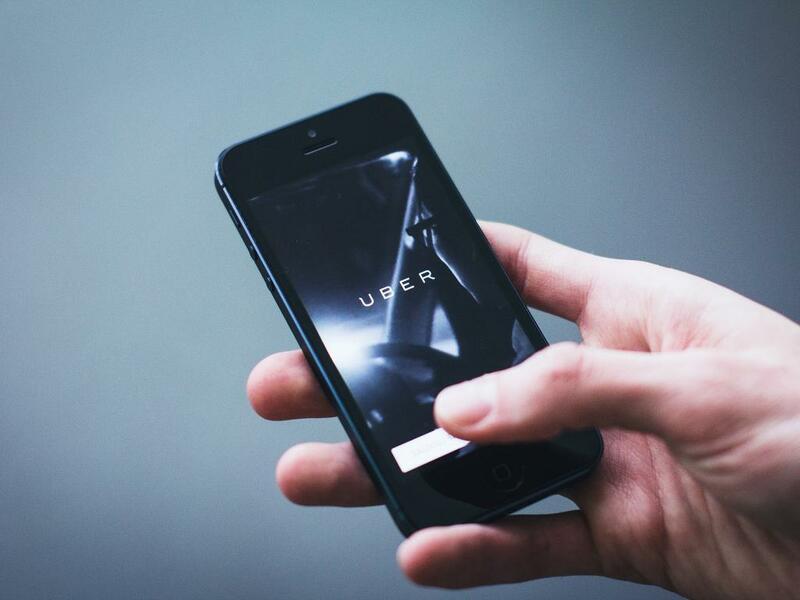 You may not buy the car at all, opting for public transportation. When the time arrives, you may postpone buying a car for a couple more years. You may save enough to pay for the car in cash so that you incur no debt. Likewise, the plans for Social Security and Medicare might change. Costs may go up, or down. The plans may be scaled back by the next generation of US citizens who think our generation was the most greedy in history. The current path and current plans are not sustainable. The money has not been spent, yet. Costs may go up or down. Political promises can easily change. Taxes may go up dramatically, to pay for the costs. 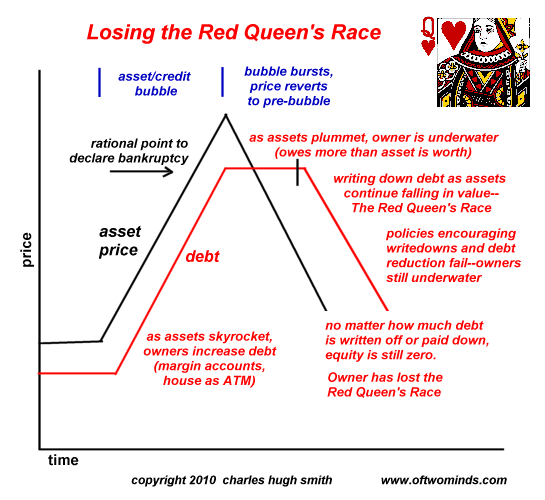 The Red Queen’s Race is an apt analogy for the meltdown in assets and debt now swamping the global economy. The Red Queen’s race refers to running very fast to stay in the same place. As asset values fall globally (except where massive government stimulus has pushed the day of reckoning forward a bit), debt holders are frantically paying down or writing down debt--running very fast--but finding themselves in the same place--zero equity--despite their prodigious efforts. Owning an asset as it catapults ever higher in a credit/asset bubble offers a fateful temptation to leverage that rising equity ("free money") or extract it to enjoy.Millions of speculators did so by borrowing against their stocks (margin accounts) and tens of millions did so by borrowing against their home equity via second mortgages or HELOCs (home equity lines of credit). Alas, when the asset bubbles bursts, values quickly begin a long and painful retrace to pre-bubble valuations. In very short order, those who bought with high leverage or borrowed 90% of their equity find themselves underwater, owing more than the value of their asset/property. Those with 80% of bubble-top value mortgages who cling to the hope of a rapid recovery in valuations soon find they too are underwater. Lenders who thought they were "safe" extending 80%-of-value loans at the bubble top find their 1-2% reserves against losses are woefully inadequate as assets continue their ceaseless decline to rational valuations. In a desperate attempt to stave off losing the Red Queen’s Race, The Federal Reserve essentially hands the banks billions in easy profits, loaning them unlimited funds at near-zero interest rates so they can "re-capitalize" by loaning their unlimited "free money" at higher rates of interest. But even the incantations and legerdemaine of the Fed are no match for the inexorable punishment of running in place just to avoid falling behind; no matter how fast the Fed-induced profits flow, they cannot gain on the declining assets. Banks pocket billions yet their net equity remains far below zero. When it comes to the asset side of the Federal Reserve’s balance sheet, there are no secrets: with the winddown of the bulk of the Fed’s emergency liquidity programs by February 1, the majority of the Fed’s current $2.2 trillion in assets will continue being outright-held securities. And even as the emergency programs sunset, the quasi-permanent, QE remnants will be here to stay. What we know for certain is that the current $1.8 trillion in Treasuries and MBS will rise to at least $2.2 trillion, as the balance of QE round 1 is exhausted. Will this purchasing of outright securities end there? Hardly. As the Fed is the only market for MBS, and as the MBS market can not allow a dramatic rise in 30 year mortgage rates, which is precisely what will happen if the buyer of first resort disappears, we fully expect some form of QE to show up and grab the baton where QE 1.0 ends. In fact just today, Fed economist Wayne Passmore, under the aegis of Atlanta Fed president Dennis Lockhart, stated during the annual American Economic Association meeting that GSE ABS should have an outright explicit guarantee by the Federal Reserve. Forget about QE then – this would be an onboarding of over $6 trillion in various assets of dubious worth, which currently exist in the limbo of semi-Fed guaranteed securities, yet which have an implicit guarantee. Of course, should the broader Fed listen to young master Passmore, look for John Williams’ expectation of hyperinflation as soon as 2010 to be very promptly met. The danger of the Fed’s next unpredictable step is so great that it is even causing insomnia for none other than BlackRock big man Larry Fink, who asks rhetorically "Are they going to kill the housing market?" Well Larry, unless the Wall Street lobby hustles, and the Fed isn’t forced to print another cool trillion under the guise of Mutual Assured Destruction, they very well might. So now that we (don’t) know about the assets, what about that much less discussed topic: the Fed’s liabilities? Last week I was in an inflation vs. deflation debate on Financial Sense with Daniel Amerman. The debate was moderated by Jim Puplava. It is a credit to Jim that he is willing to entertain both sides of an argument even though he himself is an inflationist. Amerman took the inflation side, and of course I took the deflation side. One of the main rules of any debate is to agree on definitions. In this case, there was no agreement. I believe inflation is an increase in money supply and credit while Amerman considers inflation to be a purchasing power phenomenon. This lead to different opinions as to whether or not we are in deflation. Furthermore, as with any audio discussion, there was an inability to point to charts or written material to make a case. Japan & “Where’s The Beef”? Name an example of a modern, major nation where the domestic purchasing power (as measured by CPI) of its purely symbolic & independent currency uncontrollably grew in value at a rapid rate over a sustained period, despite the best efforts of the nation to stop this rapid deflation? The problem with this line of reasoning is agreement on the definition. One could just as easily define inflation as the number of meteors visible to the naked eye at nightime and conclude inflation is a cyclical phenomena that peaks every August in conjunction with the annual Perseids Meteor Shower. Amerman did not "puncture deflation myths" because there is no agreement that his definition is the correct one.